Helene Leuschel’s debut novel is a raw look deep into the dark reality of narcissistic behaviors. 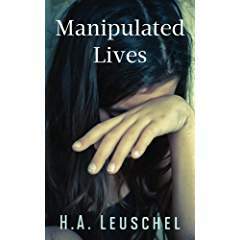 Manipulated Lives is a collection of five stories, each more haunting and poignant than the next. Five stories – five lives. All about manipulators. You can find them anywhere although at first they may be difficult to spot. These people are often masters of deception. They are witty, charming and endearing in public, yet the mask is removed in private to reveal a controlling, angry and self-centered state. The main aim of the narcissist is to dominate and bend others to their will, often without their “prey” realizing anything is amiss. All of this is to satisfy their own warped needs with a lack of empathy and compassion for the ones they take down the path of horror. In this collection of short novellas, you will meet five characters. Five people, who could easily be you or me, intent on living happy, carefree, honest lives, but instead are ensnared and damaged by a manipulative individual. You will meet the ultimate Narcissist, although he has no name, trying to make sense of his irreversible incarceration. Next you will meet Tess, a woman who’s past is haunted by one wrong decision. Sophie is living that happy life, until she is drawn into the complex life of a young boy and his father. Fifteen year old Holly, intent on making a better future for herself, and Lisa, who faces a parent’s worst regret. Each of these tales highlight the extent to which abusive manipulation can distort one’s life, and threaten feelings of self-worth. I wasn’t sure what to expect as I was immediately drawn in to the first story. I’m not usually one for short story compilations, but I’m always ready to try something new. I was not disappointed. Raw and real are the words that best describe this collection of stories. Ms. Leuschel writes with a compact cleanliness- no unnecessary details or words. The effect draws you in rapidly, as each tale grips you by the heartstrings. Emotions run wild and rampant as you hungrily turn page after page – searching for the truth, for absolution of the characters. All five stories show how both the manipulator and his/her victim have so much in common. It really brings to light how common these quiet abuses are, and leaves you feeling as though you are lost in a storm of emotion. Thought provoking, serious, this book is a thriller for your mind, each story with its own unique twist. It’s not your usual read, and that is refreshing.